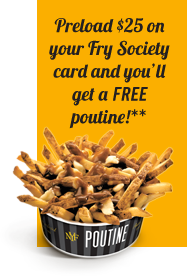 Join the NYF Fry Society loyalty program and get rewarded. It’s deliciously easy, rewarding and FREE! Register your Fry Society account here. After 10 purchases choose any one item off the menu for free. Send e-Gift Cards to friends. FREE regular fries on your birthday. Special offers available only to Fry Society Aficionados. Convenient e-Card loading at any time. * The NYF Fry Society program is available only in Canada at participating locations. ** Limited time offer; first-time use only. *** Points can now be earned once per day, on your first transaction of the day only. No app download needed for iPhone. review points, add money, or check transaction history.